From one of our finest military historians, a monumental work that shows us at once the truly global reach of World War II and its deeply personal consequences. 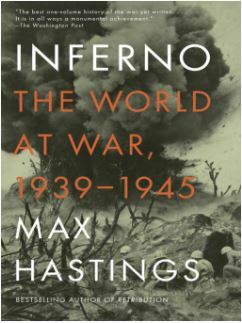 For thirty-five years, Max Hastings has researched and written about different aspects of the war. Now, for the first time, he gives us a magnificent, single-volume history of the entire conflict. Through his strikingly detailed stories of everyday people—of soldiers, sailors and airmen; British housewives and Indian peasants; SS killers and the citizens of Leningrad—Hastings provides a singularly intimate portrait of the world at war. Remarkably informed and wide-ranging, Inferno is both elegantly written and cogently argued. Above all, it is a new and essential understanding of one of the greatest and bloodiest events of the twentieth century. 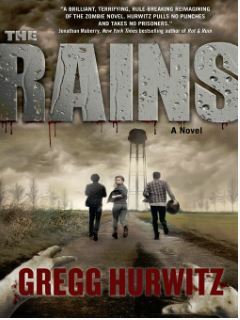 The first young adult page-turner from New York Times bestselling author Gregg Hurwitz. In one terrifying night, the peaceful community of Creek’s Cause turns into a war zone. No one under the age of eighteen is safe. Chance Rain and his older brother, Patrick, have already fended off multiple attacks from infected adults by the time they arrive at the school where other young survivors are hiding. Most of the kids they know have been dragged away by once-trusted adults who are now ferocious, inhuman beings. The parasite that transformed them takes hold after people turn eighteen—and Patrick’s birthday is only a few days away. Determined to save Patrick’s life and the lives of the remaining kids, the brothers embark on a mission to uncover the truth about the parasites—and what they find is horrifying. Battling an enemy not of this earth, Chance and Patrick become humanity’s only hope for salvation. This bold new history recovers an unknown American Revolution as seen through the eyes of Boston-born painter John Singleton Copley.Boston in the 1740s: a bustling port at the edge of the British empire. A boy comes of age in a small wooden house along the Long Wharf, which juts into the harbor, as though reaching for London thousands of miles across the ocean. Sometime in his childhood, he learns to draw.That boy was John Singleton Copley, who became, by the 1760s, colonial America’s premier painter. His brush captured the faces of his neighbors—ordinary men like Paul Revere, John Hancock, and Samuel Adams—who would become the revolutionary heroes of a new United States. Today, in museums across America, Copley’s brilliant portraits evoke patriotic fervor and rebellious optimism.The artist, however, did not share his subjects’ politics. 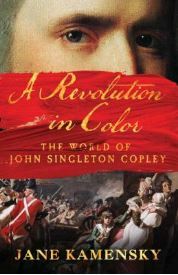 Copley’s nation was Britain; his capital, London. When rebellion sundered Britain’s empire, both kin and calling determined the painter’s allegiances. He sought the largest canvas for his talents and the safest home for his family. So, by the time the United States declared its independence, Copley and his kin were in London. 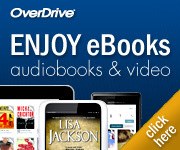 He painted America’s revolution from a far shore, as Britain’s American War.An intimate portrait of the artist and his extraordinary times, Jane Kamensky’s A Revolution in Color masterfully reveals the world of the American Revolution, a place in time riven by divided loyalties and tangled sympathies. Much like the world in which he lived, Copley’s life and career were marked by spectacular rises and devastating falls. But though his ambivalence cost him dearly, the painter’s achievements in both Britain and America made him a towering figure of both nations’ artistic legacies.